The president blames populists and unfinished land cadastre. 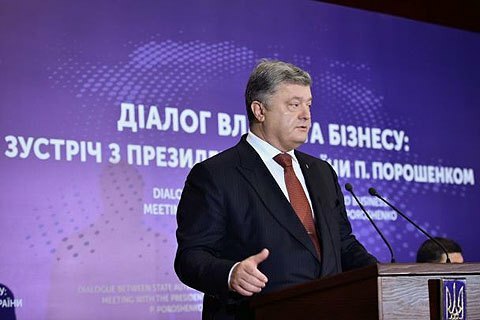 President Petro Poroshenko said that the launch of the land market in Ukraine has to be postponed for at least a year. "So far, we proved unable to break the defence of populists who vehemently oppose the free circulation of agricultural land," Poroshenko said at a Kyiv meeting with business community on Friday, 1 December. The president emphasized that the introduction of land market is part of his fundamental political stance. Meanwhile, Poroshenko said, there is time to deal with the associated matter, such as electronic land cadastre. "Look, for 25 years were have been engaged in creation of a land cadastre and it is only half-ready. No land market can function without 100% digitization of land registry," the president stressed. Poroshenko said the work on the national land registry must be completed in a year's term. Ukraine in 2002 imposed and several times extended a moratorium on the purchase and sale of agricultural land. President Petro Poroshenko in his September address promised that he would not put pressure on the Verkhovna Rada to adopt land reform. Meanwhile, land reform is a key requirement of the IMF. The World Bank earlier this year stated hopes that Ukrainian government would make the land reform a priority, complete preparatory steps and lift the moratorium in 2018.